North and South not “North and South” Hmm? “Miss Hale, I didn’t just come here to thank you. I came… because… I think it… very likely… I know I’ve never found myself in this position before. It’s… difficult to find the words. Miss Hale, my feelings for you… are very strong…” John Thornton stammered to Margaret Hale. This classic story of two different worlds within the same country really is a good mini-series. What is this fine mini-series about? It’s certainly not about the Civil War. Its about 1890’s England. 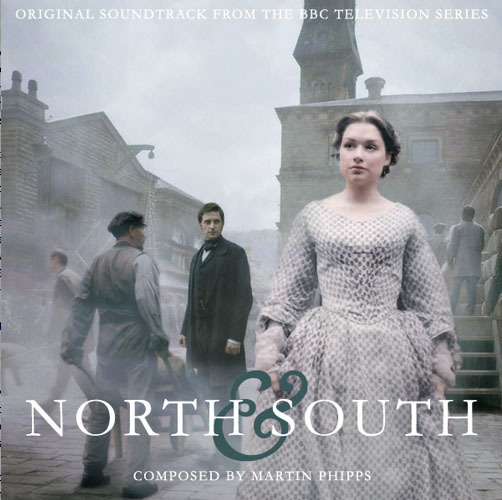 Here is the real plot…North and South is a four part adaptation of Elizabeth Gaskell’s love story of Margaret Hale, a middle class southerner who is forced to move to the northern town of Milton. Some of the cast include Richard Armitage (Thorin from The Hobbit Trilogy), Daniela Denby-Ashe (The East Enders), Tim Pigott-Smith (Alice in Wonderland), Brendan Coyle (Downton Abbey – Mr. Bates), and Anna Maxwell Martin (Becoming Jane, Death Comes to Pemberly, Bleak House, Doctor Who). The director is Brian Percival and the score is done by Martin Phipps. I really recommend this miniseries to anyone who loves British Drama. You can find the soundtrack on a special site where you can download it Here. Here are some clips from the miniseries. Well that’s it for this week, See you Sunday for Beverly Hills Cop II. Happy Listening! It’s such a good series. I should note, however, that it’s not set in the 1890’s. Costuming suggests late 1850’s to early 1860’s. Around the time of the American Civil War but not set in it.